While you may think this post will have something to do with Christmas or Holiday Traditions, it’s not. December is the time of year Stampin’ UP! demonstrators get to pre-order from the much anticipated Occasions and Sale-A-Bration catalogs set to debut in January. Last year, I needed to send a birthday card to someone celebrating a Christmas birthday, and I had one ready to go. But just then, Mr. Brown (aka UPS driver) delivered a package to my doorstep. Not just any package, but a package from Stampin’ UP! containing NEW PRODUCTS!!! Well, I looked at the clock and decided I had just enough time to open the box, play with my new goodies and create a card for this dear customer/friend who would appreciate a card made with NEW PRODUCTS more than anyone else. So I dashed down to My Stampin’ Space and created a masterpiece, with just seconds to spare before I had to leave for work. I threw my newly created card into an envelope and mailed it, just in the nick of time! I was so proud of that accomplishment, and still made it to work on time. Days later, instead of a “Thank you, the card you made for me was beautiful, and I’m drooling over the new products” like I expected, I got a “Are you kidding me? The card you sent was blank; you never signed it! Of course you stamped your ‘hand stamped by Nancy’ on the back, but you never signed it! I couldn’t believe it! I felt like an idiot! In my rush to get done, I made and mailed the card but never even signed my name. So this year, I sent her a card that wasn’t signed ON PURPOSE! After all, the tradition must go on, right? And yes, it was made with lots of new products from the new catalogs. First, there is this awesome Embossing Folder called Confetti TIEF that just looks like a party in progress. 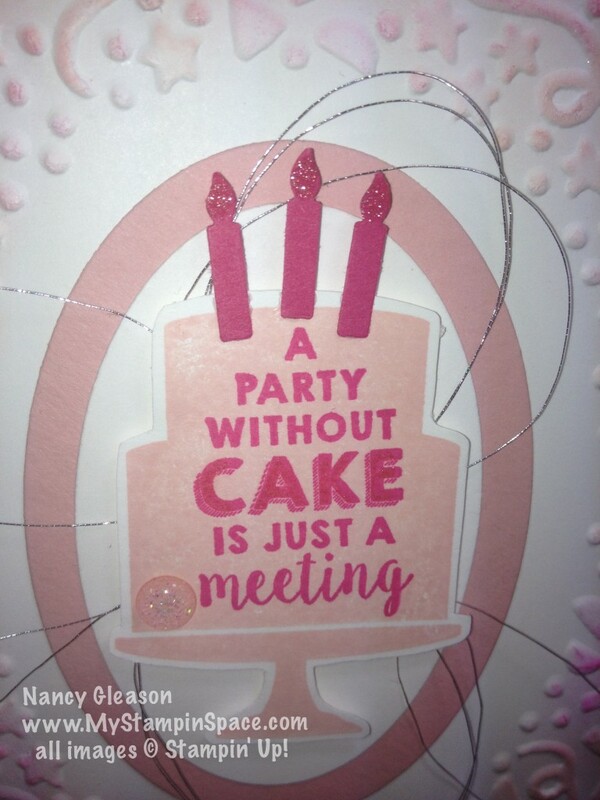 Then then stamp set called Party Wishes; don’t you just love the cake and the sentiment? And the candle punch is part of a punch pack trio called Party Punch Pack (and you can bundle and save with this stamp set and punch pack!) And you noticed that adorable little dot, didn’t you? 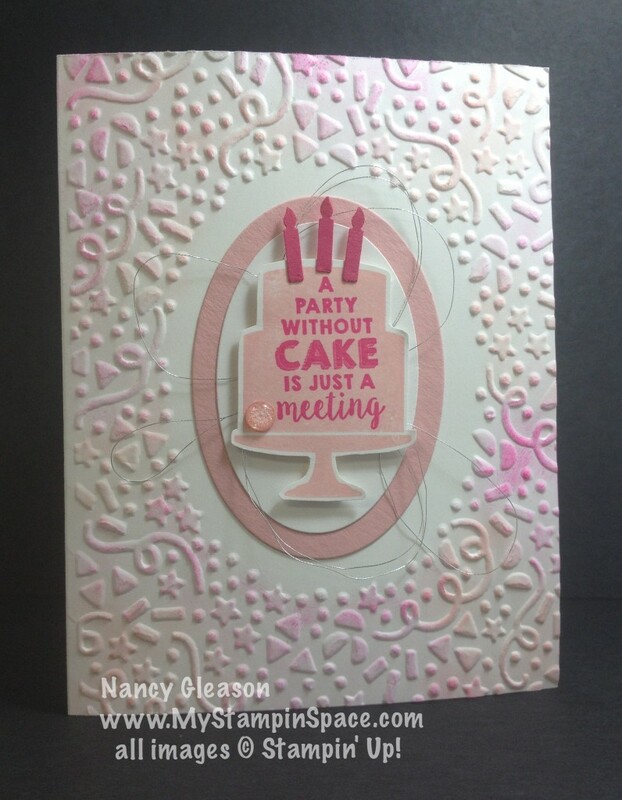 That’s from the Love Blossoms Embellishment kit. And the Icing on the Cake? It’s this cool new product called Wink of Stella. It’s a magical paintbrush that adds glittery glimmer without the mess of glitter! There’s no glue, no glitter, just a beautiful glittery shine. See how the candles appear to flicker? This is going to add so much to so many feature projects, I see it as a go-to project enhancer. I can’t wait for you to try it. Tomorrow I have another project to share with you for the New Year and then I’ll share some more birthday cards, including the one I sent that I DID SIGN! Thanks for stopping by; I welcome your comments so please take a moment and tell what you think of this card. ← A Sneak Peek JUST FOR YOU!